← How To Choose Forever Colors for Your Home When Your Home is HUGE! The verdict is in! 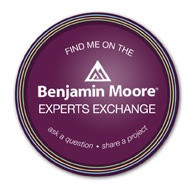 I went, I looked, I found and now I have the color results of my High Point Market trip for April 2014. This was a very interesting trip to High Point. I go in like a bull in a China shop and hunt for the hues that stand out and see where the next color progression will be. I must admit that I’m glad that blue, purple, pink and gray has taken the back burner. It was still present just not shouting very loudly. So guess what I found? Is it pink? Is it purple? Blue? Green? Neutral? Come see what I found and I’ll tell you why my finds may be different than the finds of one of the Style Spotters. This is why I wanted to get this post out quickly before the results came in from the Style Spotters. Did they see what I saw? Time will tell! First of all, since I live in Charlotte, I’m only an hour and a half away from High Point Market so I usually go for just one day and head home. That’s a lot of ground to cover but it’s a very organized trip. From my Pinterest boards of Who’s Who and What’s What, tweet ups on Twitter and Event plans on Google Plus, I already know who I’m going to meet and where I’ll be almost to the hour. It’s highly organized and really has to be on such a tight timeframe. 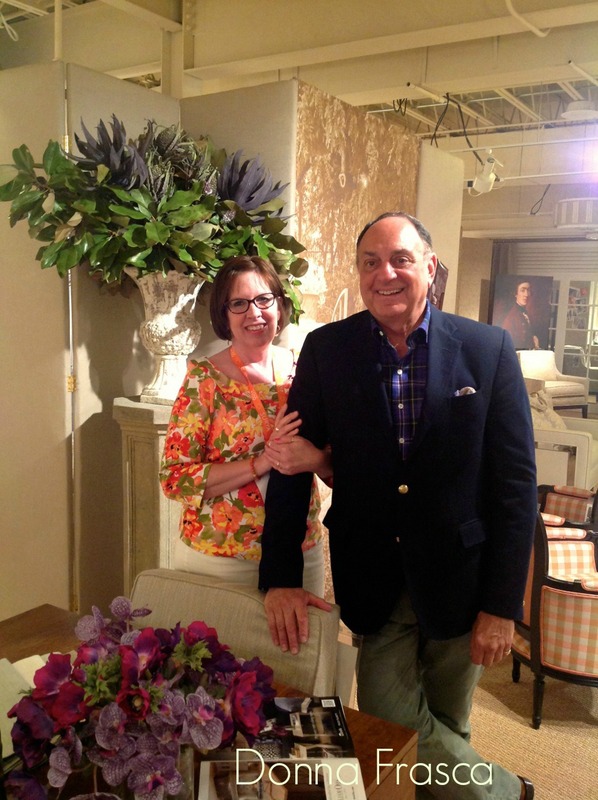 I’ve been going to High Point for many years now and I know the showrooms to visit and the Designers to meet up with to chat about their color choices. I started my High Point trek visiting Joe Ruggerio at the Miles Talbott showroom. He’s always my first stop. Joe’s showroom was very neutral (rumor mill said this is the new trend??) 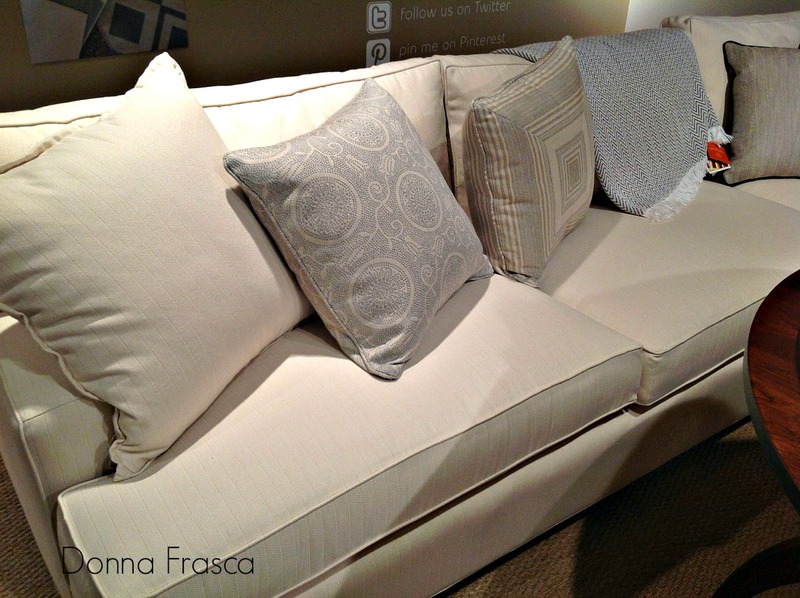 with touches of very light color from this pale blue, soft gray and creamy neutrals. 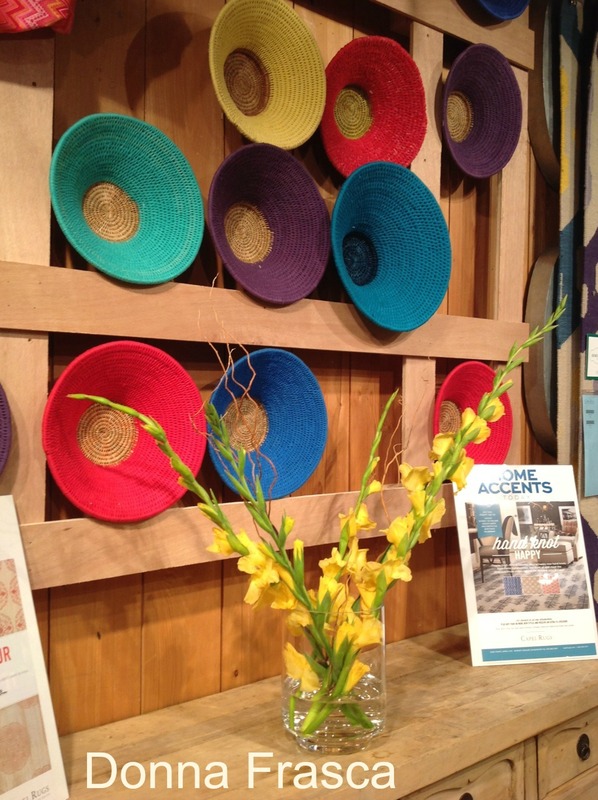 With stunning fabric from Sunbrella, his showroom has a story you’ll want to hear! One of my favorites is the pillow inspired by homemade fabrics when early Americans incorporated candle wicks into their fabrics to look like French Knots. Can you see it in that second pillow? I just loved it. Now here’s where it gets interesting. As I went from building to building, showroom to showroom there wasn’t really any one obvious color theme. Seasons back you were clearly able to see that there was a blue/orange trend or a green/coral or last year with the purple/pink but nothing really stood out as a strong color trend this time around. I did notice one element that was repeated time and time again. I noticed that there was a lot of color, all colors and a lot of patterns. Patterns and color, color and patterns. You can see what I’m talking about in these two chairs. Just about every color in the color wheel and pattern galore! 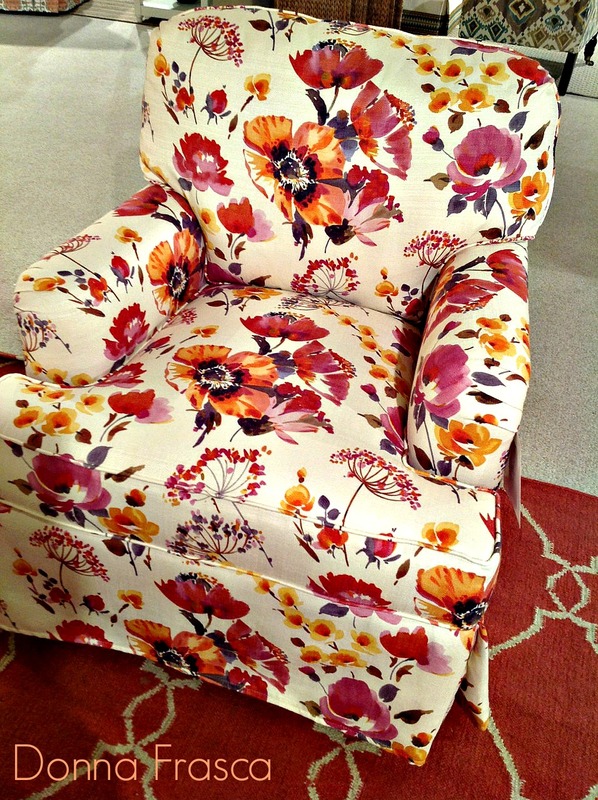 This is one of my favorite finds from Flat Rock Furniture. LOVE, LOVE, LOVE, did I say LOVE this fabric!!!! 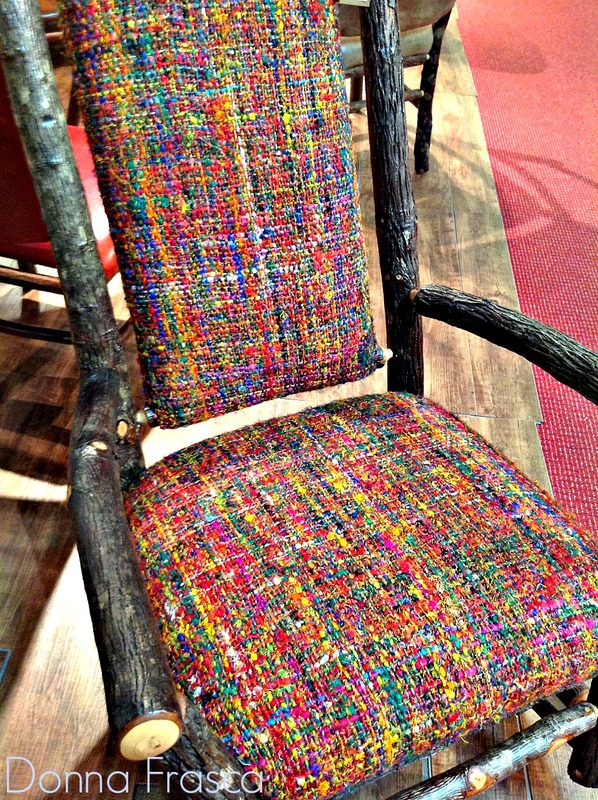 Here you have a natural bark finish with a wild and very colorful fabric. THIS is fun to the T.
Where do we go with all this pattern? Here’s where you have to put on your Designer thinking cap and figure out how to incorporate this look of pattern and color into the home. Did I hear someone say that the next “color trend” will be neutrals? That’s the only way this look will work. … is what I see happening based on what I saw at High Point – as least that is how I’d design for my clients. The design point here is to let the fabrics be the feature in the home and not the wall color (yes I just said that) and if you recall some of my posts in January, I said that 2014 is going to be a VERY colorful year and High Point has confirmed my statements. 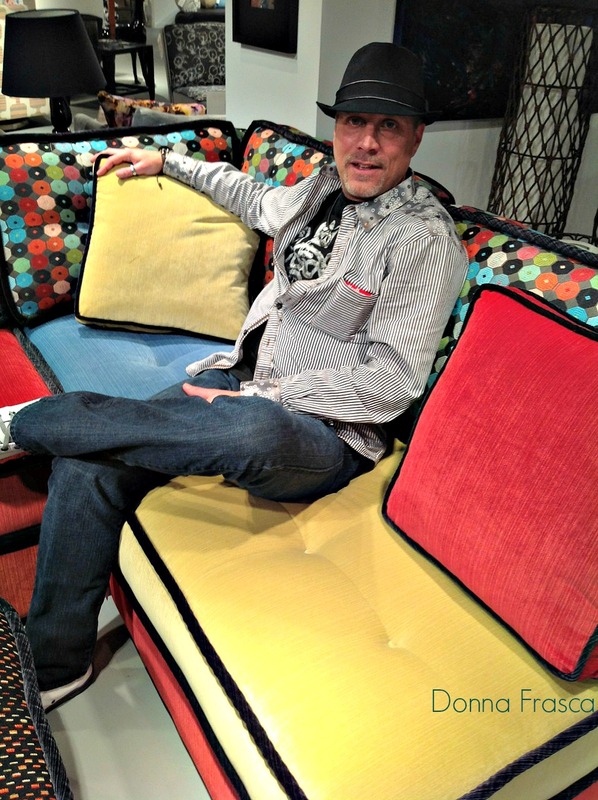 Here we have Designer Robert Petril on his LOUNGE sofa. Superb sectional design on the LOUNGE with a unique spin on fabric selection by Design and Merchandising consultant Debra Venti. With fabric choices this colorful and busy with bold patterns, you really need to have a neutral wall otherwise you may have a color overload in the home. 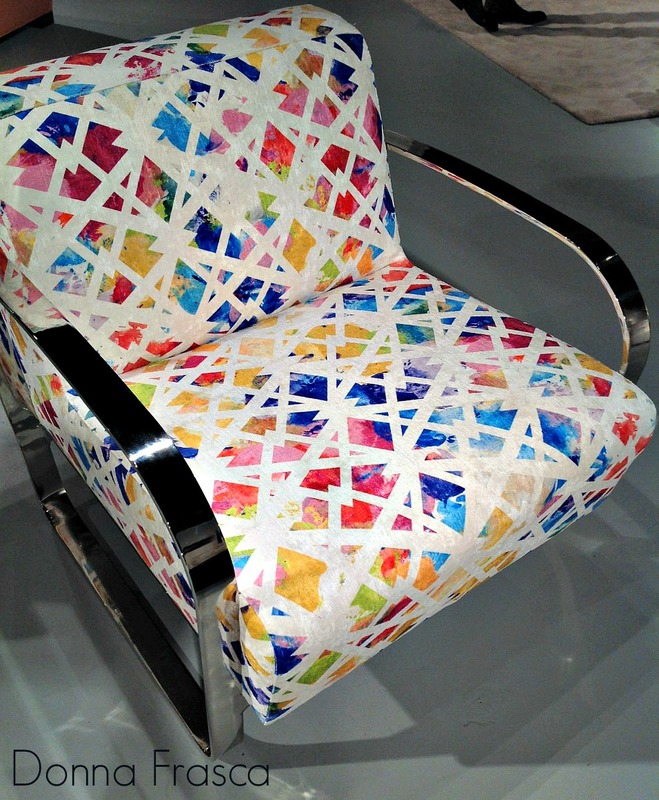 Here’s where the color and pattern get really fun. 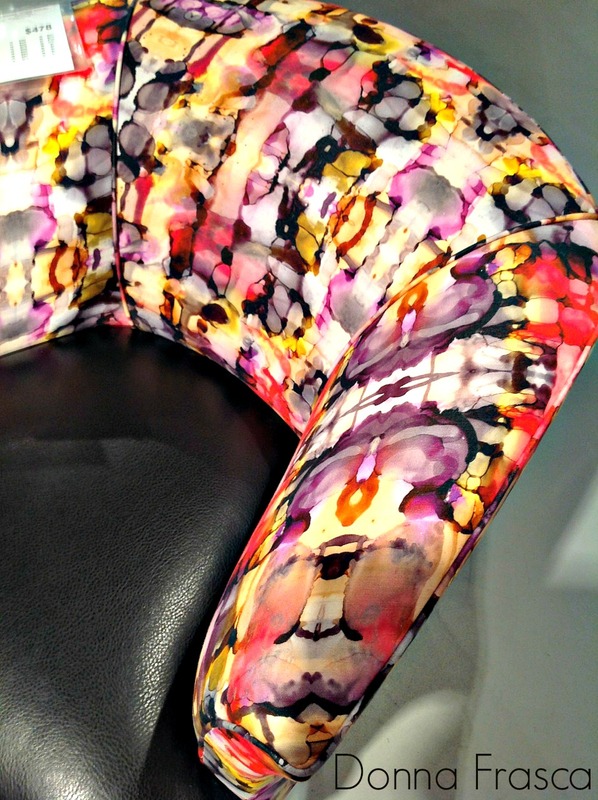 I found this silk sofa by Eccentric Luxuries who is a new exhibitor to Market and making a splash at that! 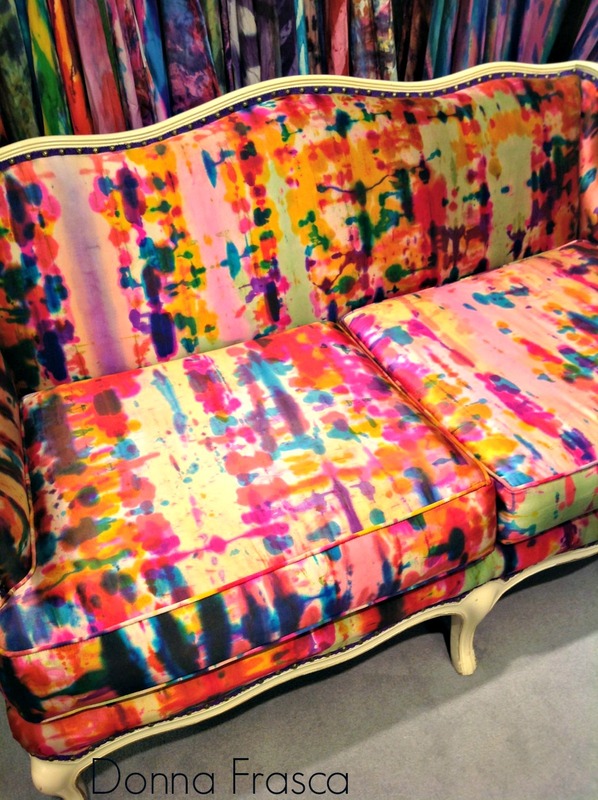 This sofa is hand painted silk. When you have a sofa that is this colorful in a room, you certainly don’t want to have any other color in the room so here’s where the neutral wall comes into play. Same company but this fabric is actually suede. So here you have both colorful fabrics and bold patterns. 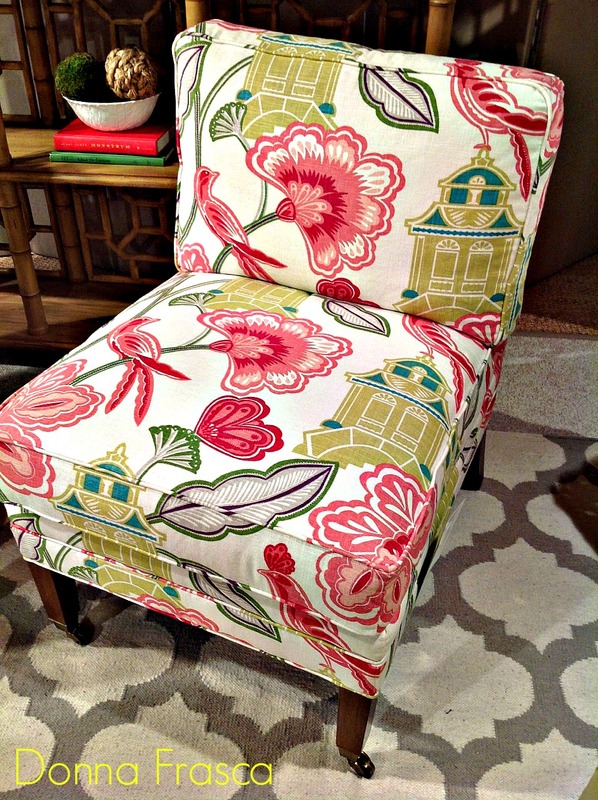 Have you seen this look in High Point? What do you think of this trend? 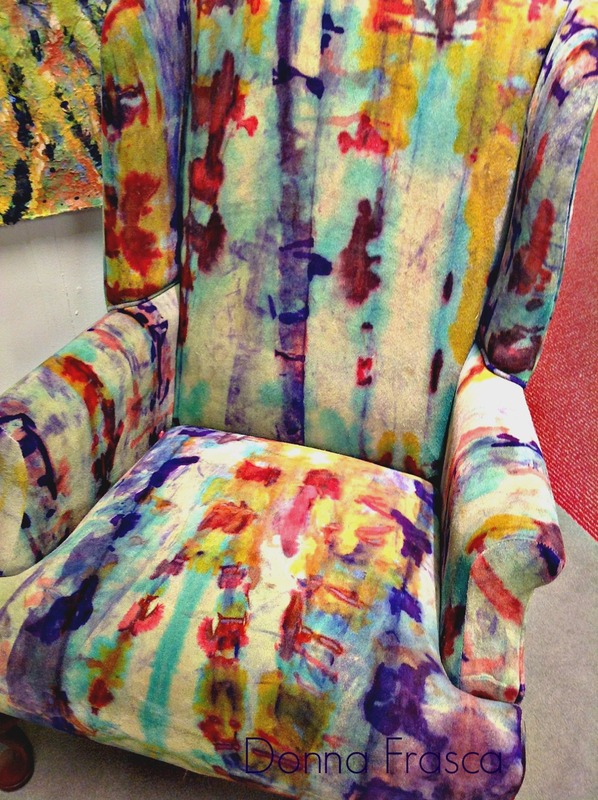 This entry was posted in Color, HIgh Point Market and tagged bold colors, bold patterns, color trends, color wheel, high point, high point market, Joe ruggerio, robert petril. Bookmark the permalink. Ahhh . . . I’m drunk with color beauty! Just gorgeous. Wow, you did find a trend in color and pattern. I like the excitement of those fabrics. Thanks for your take on what’s happening! I love bold colour and patterns! so glad we’ll be seeing more of them… and I agree with you 100%… neutrals are in, or the very least the faintest of pastels as backdrops. yes! Lots of wild patterns with just about every color combo you can thing of. Wall color will interesting this year! We will really need a neutral background to support these bold beauties. Let’s get a hangover together! I love the colorful, dancing patterns. But Wow! you really do have to have it surround by neutrals or there would be a nasty fight. As much as I love color and pattern I wonder if I would get tired of them quicker. Absolutely! I think the trick is to have just one or two pieces in the home instead of a room full. Quiet color is a must for the walls. But I love radiant orchid! I think I could find a way to use it, especially since I like the bohemian/eclectic aesthetic, lol. It was spotted in small amounts but not a very popular color for the home. It’d be perfect for an outfit though! I’m not really surprised at that. I think maybe “real” designers such as yourself prefer more doable colors for their clients, just a hunch as I am no expert, haha! I agree, great color for livening up a summer outfit though.